Who says eating vegetables has to be a chore? Getting your children to eat healthy can be an uphill battle. With so many advertisements for sugary and fatty fried foods at every turn, their ideas of what “delicious” food is can veer towards unhealthy options pretty easily. Luckily for parents, air fryers can provide healthy fried alternatives to some of the fast-food-like meals that kids crave. Here are four air fry recipes to try at home. Air fryers work by circulating hot air around food created by a mechanical fan. By adding in a small amount of oil, this will produce a crispy layer around your meal. By air-frying food at home, this will give you more control over the ingredients you are using without completely submerging them in a thick vat of oil. Here are four air fry recipes that you can make at home to help your kids fall in love with veggies. The idea that eating Brussels sprouts is just something kids have to eat in order to get to their dessert will be changed for good after trying some of the delicious air fry recipes available. For a tried and true way to crisp up your sprouts, cut a bunch of them in half and put them in a bowl with some olive oil, salt, pepper and garlic powder. Mix them up and then put them in your air fryer for around 10 minutes at 360 degrees. Whenever you speak to anyone who is trying to stay healthy in one form or another, kale usually makes its way into the conversation. This is because — unlike greens like iceberg lettuce — kale’s fiber content helps to boost blood circulation and aid in digestion. It has also been proven to help reduce diabetes, reduce blood pressure, lower the risk of cancer, and even help to prevent asthma. Needless to say, the earlier you introduce kale into your diet the better. So, using different air fry recipes for kale can help your children enjoy it as a crunchy snack before inevitably using it for salads and juices later on. 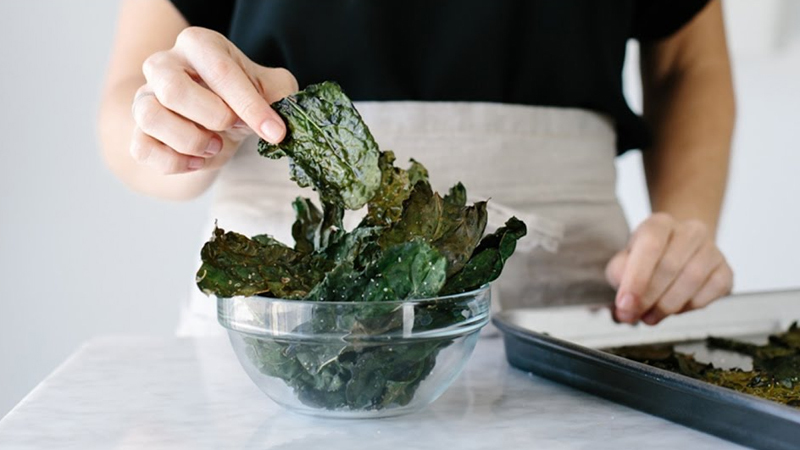 We suggest making “everything bagel” crispy kale chips. To make this snack all you will need to do is shred up pieces of kale, add it to a bowl with a tiny bit of olive oil, sprinkle in some low-sodium soy sauce, salt, garlic powder, poppy seeds and black sesame seeds. Place these coated and season leaves into the air fryer on a high setting for six minutes and shake them up periodically. They will be ready to eat once they are nice and crisp. Now, this is what air fryers were made for. 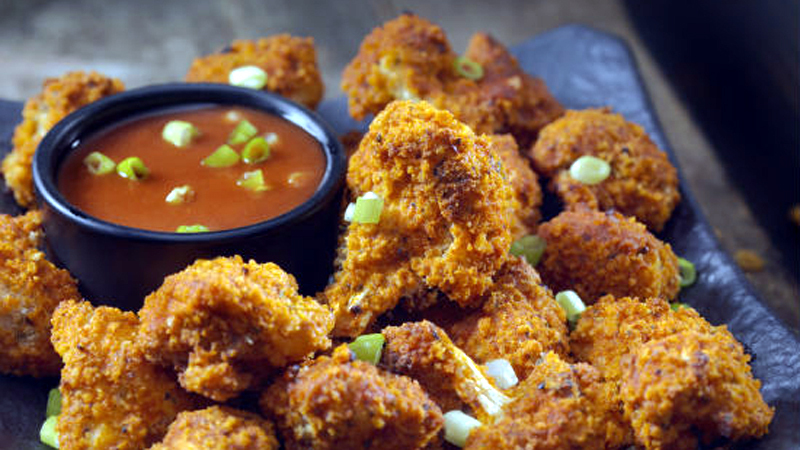 This healthy alternative to the regular buffalo chicken wing will get your kids to love cauliflower like never before. To make this recipe you will need to cut up small pieces of cauliflower, mix it in a bowl with an egg, add salt and pepper, milk and flower. After you coated the “wings” in this mixture, add them to the air fryer and cook on 350 degrees for 10 to 12 minutes. Once you have them crisped up, toss them in a bowl of buffalo sauce — Frank’s RedHot sauce and butter, to be exact — and then you will have one of the tastiest fast-food, veggie air fry recipes out there. It’s a known, indisputable fact that all children love french fries. But for a healthier option for your kids, you may want to consider using sweet potatoes instead of the normal Idaho variety. Luckily by using your air fryer, you can make perfectly crispy sweet potato fries that will be a hit with every meal. All you will need for this delicious air fry recipe is to slice a couple of sweet potatoes into strips, mix them with a dash of olive oil, add salt and pepper (or brown sugar and cinnamon if you want to go sweet instead of savory) and place in the air fryer with plenty of space for each fry. Set the heat on the air fryer to 400 degrees for the crispiest outcome.